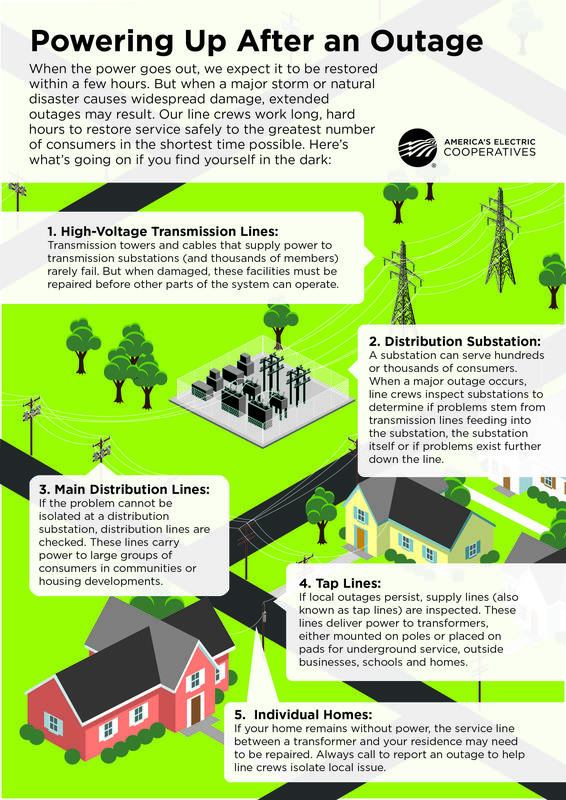 This graphic details how crews restore power to homes and businesses. Electric cooperatives throughout South Dakota are working to restore power after this week’s winter storm knocked out electric service to thousands. Brenda Kleinjan is director of communications with the South Dakota Rural Electric Association. She says the storm caused ice to build up on lines and heavy winds contributed to falling electric poles and wires. She says issues were also caused by something not common with a winter storm. "We also saw some isolated cases where poles were damaged from lightning strikes. We had one of those out west and we had one of them up in Kingsbury County. The crews are encountering some very difficult conditions. As you know, we've been having flooding and melting going on so there's some considerable amounts of mud below that crust of ice - below several inches - if not feet, of snow." Kleinjan says people need to stay away from downed power lines and treat them as they are energized. She says people need to report damages to infrastructure and slow down while driving when encountering crews working to restore power.